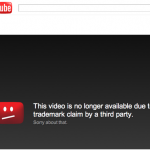 An interesting post on the YouTube blog recently puts forward the question of Fair Use and reading through the comments on the post gives the impression that YouTube are not really up for explaining their inconsistent stance on intellectual property. 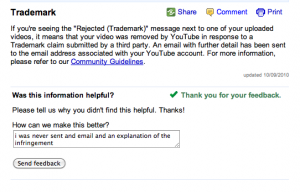 This thread on the YouTube forum backs this up. I wonder what this trademark infringement was all about? 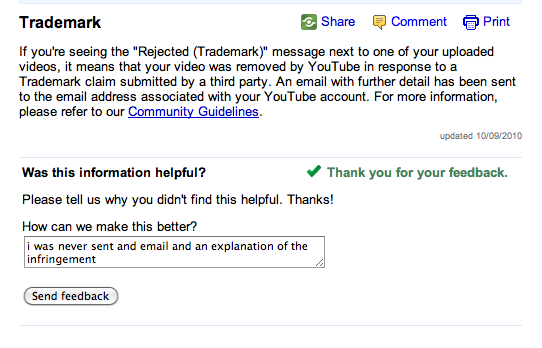 YouTube certainly hasn’t informed me, they give me no indication and no email was sent by them. I’ve got (a) copyright infringement notice(s) before, addressed to two different YouTube accounts for the same video, but that’s another story. 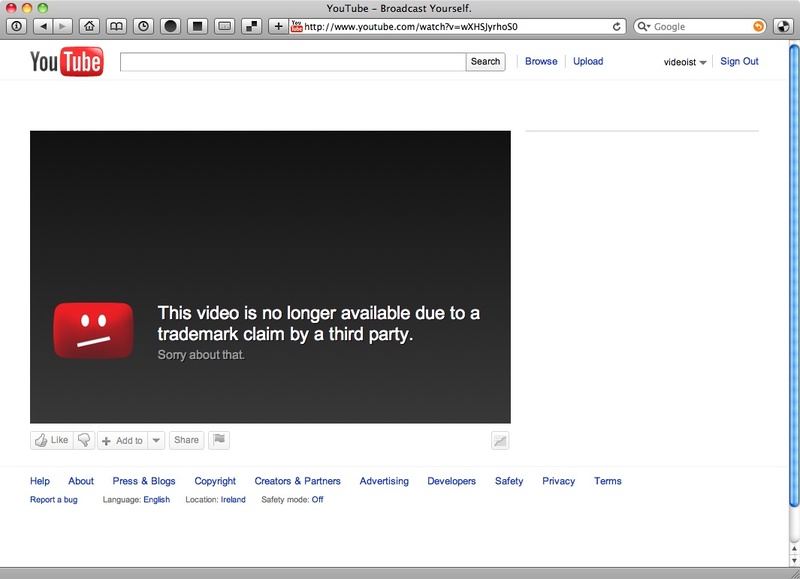 In this case, some body, most likely representing a corporate body, has filed an infringement case against me. While being part of the intellectual property bubble, trademark is something different than copyright. The Wikipedia page on Trademarks has this section.. 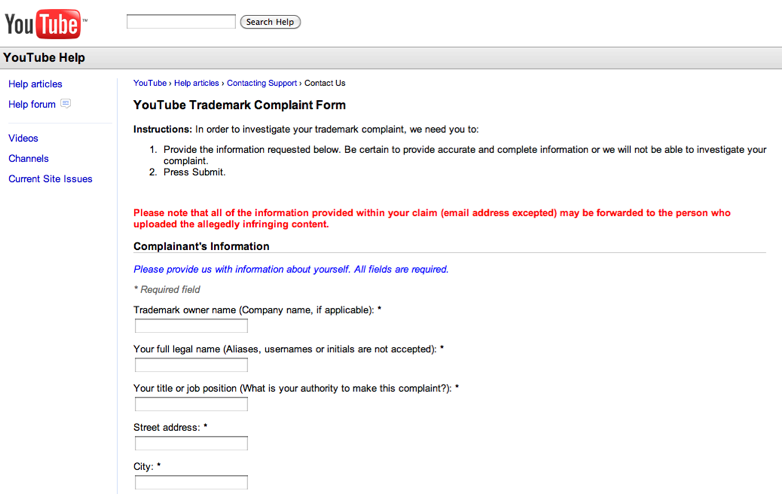 The following screengrab is the first page a trademark owner would see if they are making a complaint based on the content of a users videos (this is separate to the process of an infringing username, for example YouTube404 !). In red it gives the impression I, the alleged infringer, would know more about the nature of this allegation and who it is that alleges this. I have been putting together another story with Storify in the background (The Net Protest), about the crossover of copyright and censorship, which I haven’t got around to publishing yet. The realms of intellectual property are where I have a lot of vested interest but not in the same way that “experts” advice governments and shape policy. My interest is in the areas of open media and human rights. I will comment more on this in that upcoming post, but in the meantime I welcome your comments on this development in the census story. 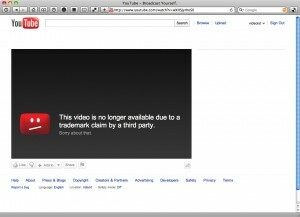 The allegedly infringing video is still available from other sources, so have a look again in the post all about it or see it below..
update: on 201105617 i emailed youtube (and cc’d in some hopefully interested people) about this… i await their response. Any interest in uploading the video directly? It’s the increasing levels of censorship in Ireland that suggest to me that Irish free media and culture initiatives like Hackerspaces and ItIsOn take a leadership role by establishing alternative release platforms. This could take the form of a Freenet-based Darknet, public wifi meshes, or just loads of USB dead drops. 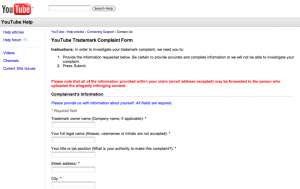 Would love to see what your Youtube censorship experience made you think of irish free speech. I agree.. feel free to republish it.. stick on discs etc.. it’s still available on blip.tv and dailmotion via links above or download via links here..
by the way, my view of free speech stems from trying to make a doc about protest movements here.. the media does well at keeping apathy levels high. what good is free speech when you can’t be heard?! i’ve lots of plans for it/is/on that fits what you say here.. ideally would like to have video hosting and make this a proper alt news outlet with credibility and a rep for opening cans of worms! can discuss more in the socnet here if you like..
dailymotion is where it’s at for now..